There is a lot to consider when you start growing your YouTube channel. Should you invest in a new camera? Should you find other YouTubers to collaborate with? Should you start sharing your videos on social media? All these questions can get overwhelming, especially when you are new to the platform. However, you must know that the demands of a YouTube channel with 0 subscribers is very different than a channel with 1 million subscribers. If you want to grow your channel, you need to focus on what matters at your level and not worry too much about what other channels are doing. 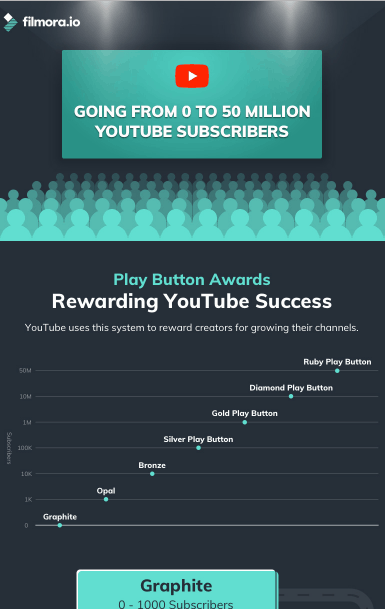 In this infographic produced by Filmora.io, you will see the different milestones you would want to hit as you continue to grow your channel. At each level, the infographic shows you what key areas you should put your attention on to get the best results out of your efforts.